With an oral examination and x-rays of the mouth, Dr. Wang and Dr. Amini can evaluate the position of the wisdom teeth and predict if there are present or future potential problems. Studies have shown that early evaluation and treatment result in a superior outcome for the patient. Patients are generally first evaluated in the mid-teenage years by their dentist, orthodontist, or by an oral and maxillofacial surgeon. 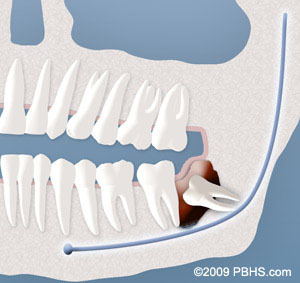 Have you had the development of your Wisdom Teeth evaluated? Call us at Cascadia Oral Surgery, Kirkland WA Phone Number 425-358-2726 to Schedule your Wisdom Teeth Oral Examination with Dr. Wang or Dr. Amini in Kirkland. On the day of your procedure, you will take medications to help minimize post-operative pain and swelling. We ask that a parent or responsible adult accompanies you to the office and plans to stay with you the rest of the day. The procedure will take about 30 to 60 minutes and you will probably be in the office for 90 minutes. Recent advances in medicine and technology allow patients to undergo wisdom tooth removal in a manner which promotes rapid healing and minimal post-operative discomfort. State-of-the-art sterilization and infection control techniques are used at all times. On the morning or afternoon of your surgery, it is essential that you have nothing to eat or drink (excluding prescription medications with a sip of water) for at least six hours (preferably longer). This does not mean you should try to fit in one “last meal” exactly six hours before your surgery. Having anything in your stomach can increase the risk for serious anesthetic complications, including nausea and vomiting. 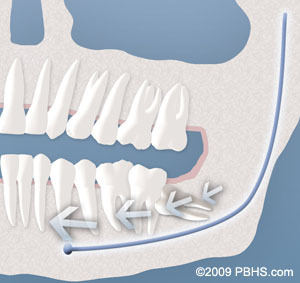 Your procedure will be rescheduled if you have not heeded these guidelines. We may provide you with a prescription for pain medication at your consultation appointment, which for your convenience, can be filled in advance. When you are seated in the surgical room, we will make every effort to make you as comfortable as possible. If you are going to be sedated, we usually will place an IV in your left arm. This is a quick and nearly painless procedure that ensures optimal delivery of your medication. Local anesthesia is given to you afterwards to ensure comfort, and allow adequate time to travel home and rest. You will be sleepy for a significant portion of the day. We do not recommend using dairy products such as yogurt, ice cream, or milkshakes on the day of surgery as nausea and vomiting may develop in conjunction with the anesthetic and pain medication. If you are given antibiotics and you take birth control pills, please be aware that the birth control pills might become ineffective and take appropriate precautions. The fee for your treatment is determined by a number of factors. These may include the difficulty involved in removing your teeth and which type of anesthesia is best for you. During your consultation appointment, the surgeon will need to review your x-rays, complete an examination, and determine the best option for anesthesia before an accurate estimate can be provided. Every insurance company has a different policy regarding the extent of coverage for a given surgical procedure. The oral surgeon’s office staff will help you obtain maximum insurance coverage for your treatment. At the time of your consultation, your specific situation will be discussed in greater detail. We encourage you to ask any questions you may have. If new questions arise after your consultation, please call our office at Cascadia Oral Surgery, Kirkland WA Phone Number 425-358-2726 to speak to one of our patient care coordinators. Super easy to set up an appointment. The office was clean and they have a super cool high tech X-Ray Scanner. Would definitely recommend. Very professional and superb surgery. Not in pain at all after the surgery. Pain went away just in 2 days which I didnt even expect. I would definitely recommend this facility and Doctors for anybody. DR. RAMTIN AMINI was my doctor and just awesome. Patrick was extremely helpful and friendly throughout the entire process. He operates with the utmost professionalism and expertise, and he was very calm and collected throughout the procedure. This was my first time under general anesthesia and he was able to put me at ease. I would highly recommend anyone to see Dr. Wang for any work needed. Dr. Wang is by far the best oral surgeon I know. I had a difficult impacted tooth that was to be extracted. Dr. Wang did such a amazing job taking it out. He has great smell and expertise. CHe made sure I was comfortable through out the procedure, had minimal discomfort throughout and after procedure. Dr. Wang and Galina were very nice and patient with me and also followed up to make sure I was doing ok. I highly recommend Dr. Wang and team. I had a wisdom teeth sugery done by Dr. Ramtin Amini and I was very pleased with my overall experience. He was very professional and went over the procedure with me. The surgery was quick and painless. I will definatly recommend him.